Race day is EXHILARATING. From waking up exceedingly early to being surrounded by hundreds of thousands of jittery runners waiting in long lines for porter potties, sucking down gel carbohydrate blends, sipping water, running or pacing back and forth, stretching, dancing and shaking their hands with nervous energy; it's a spectacle. Then you are literally corralled into holding pens until you are released into the wild as you try not to trip over each other moving like herded cattle over the starting line and onto the course. If that doesn't sound like a good time I don't know what is! Performing well when it matters most presents a paradoxical challenge to the runner: the more one focuses on the outcome the less likely they are to perform well in the moment. But since the outcome really matters it is difficult not to think about the results of all the hard work that you have put in training for this one opportunity. So how does one go about staying focused on the process rather than a result? In other words, how does one pretend the outcome doesn't matter and that this is just another training run? The key is in something that you said in your email, "I am incredibly confident. I couldn't have trained harder or be in a better or happier place mentally. I am so excited for this weekend." 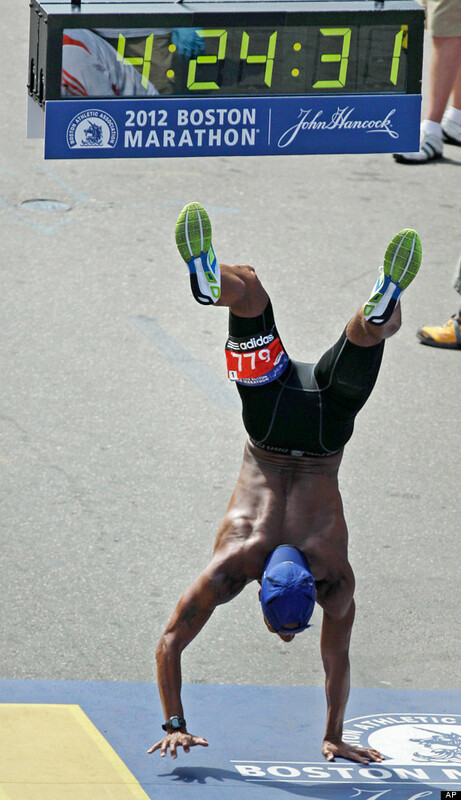 The key to performing well this weekend will be holding onto that feeling throughout the race. When you catch yourself thinking ahead to the finish line and the time you might achieve, refocus back onto the joy of running the race in that moment. Check in with a friend, take a selfie, take a couple deep breaths and remind yourself of why you run in the first place, anything that keeps you focused on the here and now will work. If you want to get more serious about this, check in with your body; how do your legs feel, how is your breathing, is your upper body relaxed, could you go a little harder if you wanted to? if the answer is yes, then pick up the pace for a little bit. If that feels good, maintain that pace. What you are doing now is to focus on the process rather than the outcome, and that paradoxically, will get you the time you're actually looking for. To summarize: stay in the moment; focus on the process, not the outcome; remember why you run and have fun; and when you catch yourself thinking about the outcome too much, take a deep breath and refocus on the here and now. Good stuff right? My Uncle Bob has an incredibly contagious spirit and is always advocating for fun. He’s the first person to tell you that growing up is over rated, stay in school and soak up as much knowledge as you can and to enjoy every single thing you do. His spirit if infectious and his passion for sports is unparalleled. Recently he was diagnosed with Parkinson’s disease and he is currently raising money for a three day triathlon he holds on his birthday. He is fundraising for Team Fox which is The Michael J. Fox Foundation's (MJFF) grassroots community fundraising program. He’s an amazing man raising money for an amazing cause that hits very close to home. CLICK HERE to read more about his awesome fundraising effort. Most events post their race day courses well before the race. Sit down with it and get familiar with bathrooms, water/sports drink stations, hills/inclines and first aid stations. In the perfect scenario you won’t need first aid or a bathroom but things happen. Maybe it’s hotter than you expected, someone crashes into you, pre-race jitters are causing GI troubles, things happen and if you have an idea of where things are when speed bumps arise, you won’t panic. Finishing the race is the super objective for any event but within that you want to be have a realistic goal time you are running for. If you’re trying for a PR set your goal time and a plan of attack. Figure out your race pace, do you plan on running evenly throughout or do you plan on running negative splits? Sometimes it helps to actually write your mile paces on your hand or on a wristband. Knowing where you should be keeps you on track and prevents you from having to do math as you run. Get that inner monologue ready because you have a long race ahead of you. It’s incredibly important to keep all self-talk positive. Your body and brain know where you’re at. You’d be amazed at what you can trick your brain into doing. I break the race up into sections. Instead of trying to run 13.1 miles I focus on getting to miles 3, 6, 9, 10, 13, then the finish line and I celebrate when I get to every single marker. Smiling makes a huge difference! If you find yourself struggling, focus on the people around you and smile at them! All spectators are fare game and they are literally yelling empowering and positive things at you so engage with them! Smile! Give high fives. Laugh at their funny signs. Embrace their cow bells and shakers. Find a distraction and get back into the positive zone. Try a mantra “just keep swimming,” “you’ve got this,” or “one more mile!" Whenever you start to feel your feet get heavy, your mouth get dry or if you start to have doubts put on a smile, tell yourself how awesome you are and look up. It’s going to be over before you know it. If it’s your first taper you’re probably feeling lazy or restless. It feels unnatural to taper before a big race and brace yourself for some meltdowns. Show up to the starting line ready to leave it all behind. You have to trust the work you’ve done. If you’re not ready or if you hit the wall, you will cross that bridge when you get there. (You can always walk. I know it may seem like a disappointment but give yourself permission to do whatever you need to do to finish.) Believe in yourself and have the confidence and optimism to continue to move towards that finish line. Leave everything at the starting line and trust your training. 5. 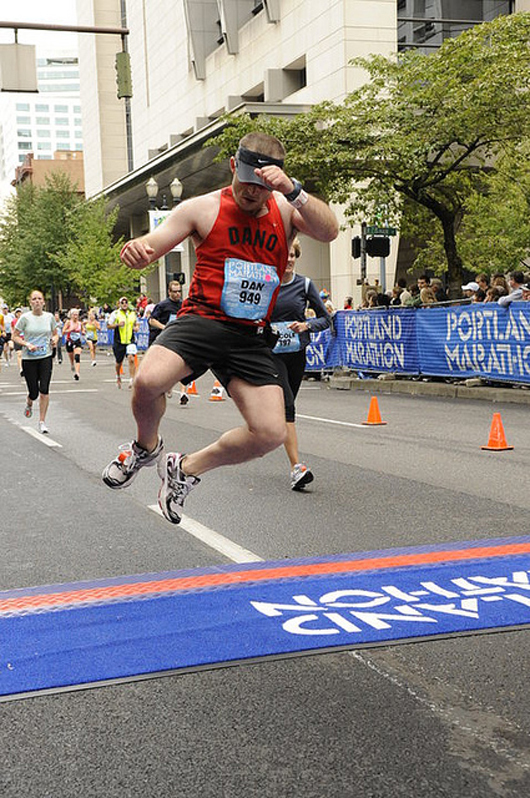 Cross The Finish Line Like A Boss! I dare you to ham it up for your photo finish! Use the hashtag #RunSelfieRepeat and show your stuff! Make it a moment to remember! Throw those arms in the air, jump, and dance, show us what you got because you just ran an ungodly amount of miles and it’s not even 10am! Alright friends, play some eye of the tiger because it's go time. I hope these tips helped and thank you to my Uncle Bob for sharing his brilliant words!